Nephrolepis cordifolia 'Duffii' is a real must for all plant enthusiastics. Additional information about this plant will become available later. 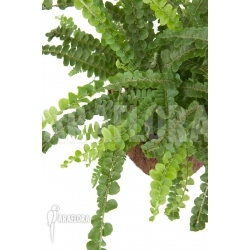 Nephrolepsis exaltata marisa is commonly known as the sword fern or fishbone fern, because of its dense, lacy triangular fronds which can be as long as 30 centimetres. This exotic plant is found in numerous tropical and humid regions of the world. Confusion exists about the origins of its other common name, the Boston fern. One source suggests that this mutation of Nephrolepsis exaltata was first discovered on a journey from Philadephia to Boston, while another says it derives from John Soar, a pioneer plant breeder who sent a specimen of the fern to a friend in Boston. Nephrolepsis exaltata marisa preferes part shade with enough indirect sunlight. It needs a moist growing medium with sufficient nutrients, although it only needs fertilising once a year. It needs to be soaked in water once a month to ensure that it does not dry out, but the water must drain thoroughly and the plant should not be left standing in water. Coming from a humid environment, it needs misting with water at regular intervals. In winter, when the central heating is turned up, there is a real danger that it will dry out if it is not sprayed.